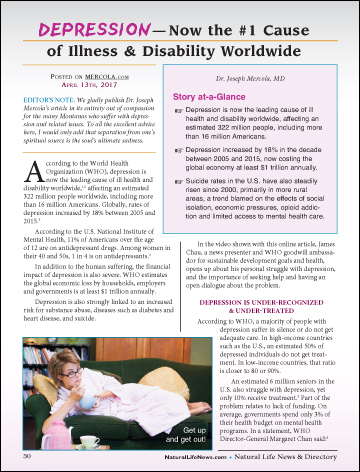 EDITOR’S NOTE: We gladly publish Dr. Joseph Mercola’s article, as posted on Mercola.com on April 13th, 2017, in its entirety out of compassion for the many Montanas who suffer with depression and related issues. To all the excellent advice here, I would only add that separation from one’s spiritual source is the soul’s ultimate sadness. According to the World Health Organization (WHO), depression is now the leading cause of ill health and disability worldwide, affecting an estimated 322 million people worldwide, including more than 16 million Americans. Globally, rates of depression increased by 18% between 2005 and 2015.